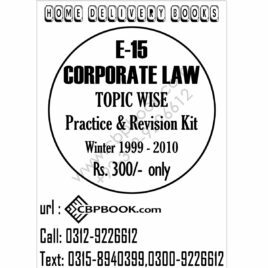 Corporate Laws Made Easy Text Book CFAP 2 by Atif Abidi 2018 Sixth Edition CA CFAP 02 Text Book Corporate Laws Made Easy Sixth Edition 2019 By Atif Abidi The Mind Maps Updated as per Companies Act, 2017 (Winter 2018 attempt and onwards) Including topic wise past papers of ICAP (Summer 2008 till Summer 2018) LOOK INSIDE EDITION 25 July, 2018 AUTHOR Atif Abidi CONDITION new cbpbook.com offers ca cfap 2 corporate laws made easy by atif abidi 2019 6th edition buy online with best lowest price in Pakistan with fast shipping in all major cites of Pakistan including Karachi, Rawalpindi, Sialkot, Islamabad, Gujranwala, Hyderabad, Faisalabad, Quetta, Peshawar, Multan, Larkana, Lahore, Abbotabad, Sargodha, Sukkur and many more cities in Pakistan. NAME CA CFAP Level 2 Corporate Law / Company Law Deal THIS DEAL CONTAINS THE FOLLOWING BOOKS: 1) Corporate Laws Made Easy By Atif Abidi 17-18 5th Edition 2) Corporate Laws Yearly Past Papers From 2006 To Summer 2017 3) S.A. Salam’s Complete Company Law & Procedures Vol. I & II 2017 CONDITION new cbpbook.com offers ca cfap level 2 corporate law / company law deal buy online with best lowest price in Pakistan with fast shipping in all major cites of Pakistan including Karachi, Rawalpindi, Sialkot, Islamabad, Gujranwala, Hyderabad, Faisalabad, Quetta, Peshawar, Multan, Larkana, Lahore, Abbotabad, Sargodha, Sukkur and many more cities in Pakistan. NAME Corporate Law Decisions [CLD] September 2017 Vol XVI Part 9 - PLD Publisher LOOK INSIDE PUBLICATIONS PLD Publisher cbpbook.com offers corporate law decisions [cld] september 2017 vol xvi part 9 - pld publisher buy online with best lowest price in Pakistan with fast shipping in all major cites of Pakistan including Karachi, Rawalpindi, Sialkot, Islamabad, Gujranwala, Hyderabad, Faisalabad, Quetta, Peshawar, Multan, Larkana, Lahore, Abbotabad, Sargodha, Sukkur and many more cities in Pakistan. NAME S.A. Salam's Complete Company Law and Procedures Volume I The Companies Act, 2017 VOLUME Volume 1 AUTHOR Sheikh Asif Salam Chartered Accountant CONDITION new cbpbook.com offers sa salams complete company law and procedures volume i buy online with best lowest price in Pakistan with fast shipping in all major cites of Pakistan including Karachi, Rawalpindi, Sialkot, Islamabad, Gujranwala, Hyderabad, Faisalabad, Quetta, Peshawar, Multan, Larkana, Lahore, Abbotabad, Sargodha, Sukkur and many more cities in Pakistan. NAME S.A. Salam's Complete Company Law and Procedures Volume II VOLUME Volume 2 AUTHOR Sheikh Asif Salam Chartered Accountant CONDITION new cbpbook.com offers sa salams complete company law and procedures volume ii buy online with best lowest price in Pakistan with fast shipping in all major cites of Pakistan including Karachi, Rawalpindi, Sialkot, Islamabad, Gujranwala, Hyderabad, Faisalabad, Quetta, Peshawar, Multan, Larkana, Lahore, Abbotabad, Sargodha, Sukkur and many more cities in Pakistan. EDITION October 25, 2015 AUTHOR Atif Abidi ACA, M.Phil(Cont) PUBLICATION Waheed Book House CONDITION new cbpbook.com offers corporate laws made easy third edition 2015 2016 atif abidi buy online with best lowest price in Pakistan with fast shipping in all major cites of Pakistan including Karachi, Rawalpindi, Sialkot, Islamabad, Gujranwala, Hyderabad, Faisalabad, Quetta, Peshawar, Multan, Larkana, Lahore, Abbotabad, Sargodha, Sukkur and many more cities in Pakistan. NAME Study Text Corporate Laws for CA Module E Second Edition Ishfaq Publishing Company PAC (The Professionals Academy of Commerce) AUTHOR Aamir Shahbaz EDITION 2nd Edition PREPARED BY The Professionals Academy of Commerce PUBLICATION Ishfaq Publishing Company CONDITION new cbpbook.com offers study text corporate laws for ca module e second edition ishfaq publishing company pac the professionals academy of commerce buy online with best lowest price in Pakistan with fast shipping in all major cites of Pakistan including Karachi, Rawalpindi, Sialkot, Islamabad, Gujranwala, Hyderabad, Faisalabad, Quetta, Peshawar, Multan, Larkana, Lahore, Abbotabad, Sargodha, Sukkur and many more cities in Pakistan.